Luckily, I have a group of amazing blogger friends who didn’t skip a beat before offering to step in and help out. I was considering letting the blog go dormant during these wedding-heavy periods but so many wonderful, talented and supportive women volunteered to pitch in to keep this space alive in my absence instead. I cannot find the words to express my gratitude, and I am so excited to share their beautiful and mouthwatering posts with you. The first of these exceptionally wonderful women is Allie, who runs the phenomenally successful blog Baking a Moment. She hasn’t been blogging long (I think her blog only recently celebrated its first “birthday”) but her skills are, frankly, superhuman. If you have been following this blog for awhile, you have heard of her before (here and also on Buttercream Fanatic) and I’m telling you, if you don’t already follow her work, you should start now (also find her on Facebook, Twitter, Instagram and Pinterest), or else you might really miss out on something wonderful. Exhibit A: the cookies below. 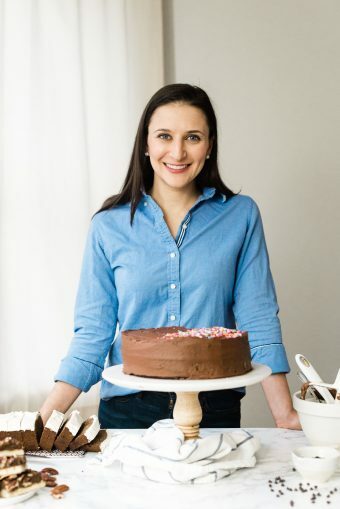 Allie typically bakes with conventional ingredients like wheat, dairy, sugar, etc, in her recipes, and I told her that it was fine for this guest post to stray outside of the normal A Clean Bake restrictions. But she wouldn’t hear of it. I’m so touched by how much work she clearly put into this recipe, because it is not just outside of her typical comfort zone, but is as flawless as any of her buttery, gluten-y masterpieces. I’m telling you: there is nothing this woman can’t do. On top of being a professional-caliber baker, an amazing teacher who breaks down these stunning (and frequently intimidating, at least to me!) dishes into totally un-intimidating and manageable steps that anyone can follow, she is a wonderful writer, a talented photographer whose pictures are never less than jaw dropping, and a selfless and supportive friend of the kind that you just don’t come across every day. Sorry to gush, but it’s true! Allie, thank you, truly, for the support and friendship you have given me, and for this beautiful recipe which I know was a lot to ask, given the ingredient restrictions. As usual, you nailed it. Not that I ever had any doubt, of course! You are amazing. Hey, everyone! I’m so happy to be filling in for Nora here today. I’m a huge fan of A Clean Bake and especially of my friend Nora. 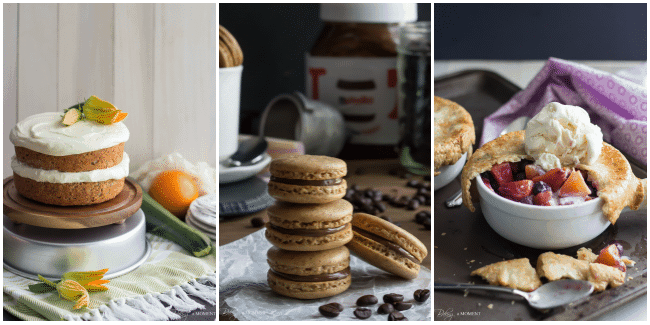 My name’s Allie, and I usually blog over at Baking a Moment. Nora and I met just about a year ago, when Mystery Dish was getting off the ground. Back then, she was blogging at Buttercream Fanatic, and the connection was instantaneous. We immediately bonded over our mutual love of indulgent desserts. As we emailed back and forth, sharing photography tips, our friendship grew. I just love Nora and I have so much respect for what she does. I honestly don’t know how she is able to create the most magnificent breads, cakes, and treats without using any of those ingredients that I rely on so heavily. Every one of her posts just leaves me with my jaw hanging open, and my mouth watering. Reading A Clean Bake can get a little messy for me. So, with Nora off taking care of last-minute wedding preparations, I really wanted to honor her, and take a walk in her shoes for a day. Gluten free, dairy free, and refined-sugar free desserts are not my area of expertise, but my boys and I really enjoyed this treat! 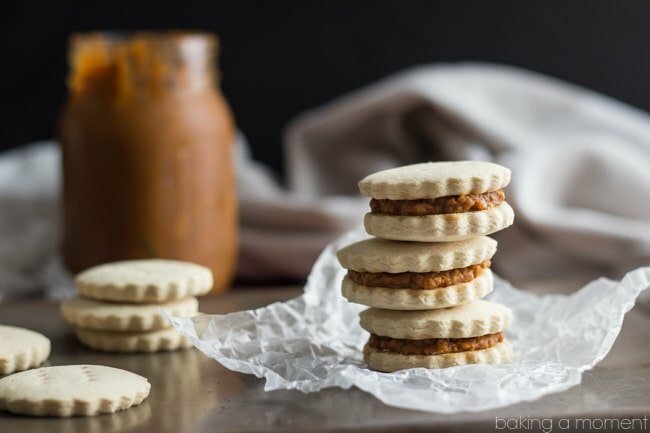 Alfajores are a traditional South American cookie that is made with cornstarch, to give it a really tender, almost melt-in-your-mouth kind of texture. Traditionally, they’re filled with dulce de leche, but, oh ya- hi, cream, butter and sugar. We’re not going there today. But it’s all good yo. Pumpkin butter is really where it’s at anyway. It is Fall (almost) after all! I added some bourbon whiskey to the cookies (in place of the traditional pisco), and a little maple syrup, and all the flavors get along so nice with the earthy pumpkin and warm spice. Truth be told, I’ve never actually tasted authentic alfajores, so I really don’t know how these stack up to the real deal. However, the original recipe really lent itself well to an allergen-free adaption. I don’t have a lot of fancy specialty flours on hand, so I knew that I’d want to start with something that didn’t have a whole lot of flour in it to begin with. From there, it was easy enough to swap the butter out for coconut oil, and the sugar for maple syrup. The texture of these cookies is so light, and the flavor is just a leeettle sweet. They almost remind me of a Vanilla Wafer. You remember those from your childhood? Or, if you’re a mom, you know those teething biscuits that you gave to your kids when they were babies? Sometimes they’re called Zwieback? My boys used to gum on them and they’d just melt- perfect for their little toothless mouths. And the pumpkin butter couldn’t be simpler to make. Just throw the pumpkin puree in the pot with the spices and some softened dates, and simmer away. 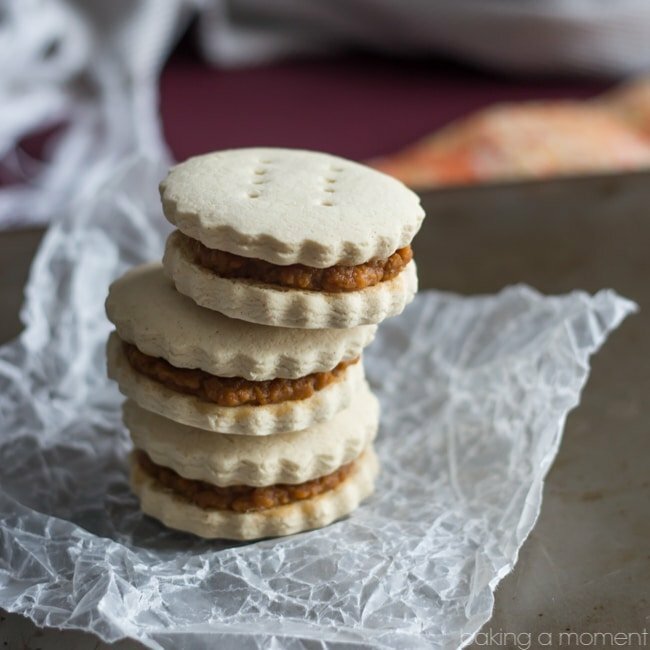 Sandwich the cookies with a generous dollop of pumpkin butter, and transport yourself to gluten-free-dairy-free-refined-sugar-free pumpkin pie heaven. Place the pumpkin, apple juice, dates, maple syrup, and spices in a large saucepan and simmer for 30 minutes. Remove from heat and add the lemon juice. Process with a hand blender until smooth. Place the coconut oil and maple syrup in a large bowl and mix on low speed until combined. Stir in the egg yolks, bourbon, and vanilla. Place the cornstarch, baking powder, baking soda, and salt together in a smaller bowl and stir with a whisk to combine. Add the dry ingredients, a little at a time, to the coconut oil mixture, while stirring, until the dough comes together into a ball. Wrap the dough tightly and refrigerate for 15-20 minutes. Roll the dough between two sheets of parchment, to a thickness of ¼-inch. 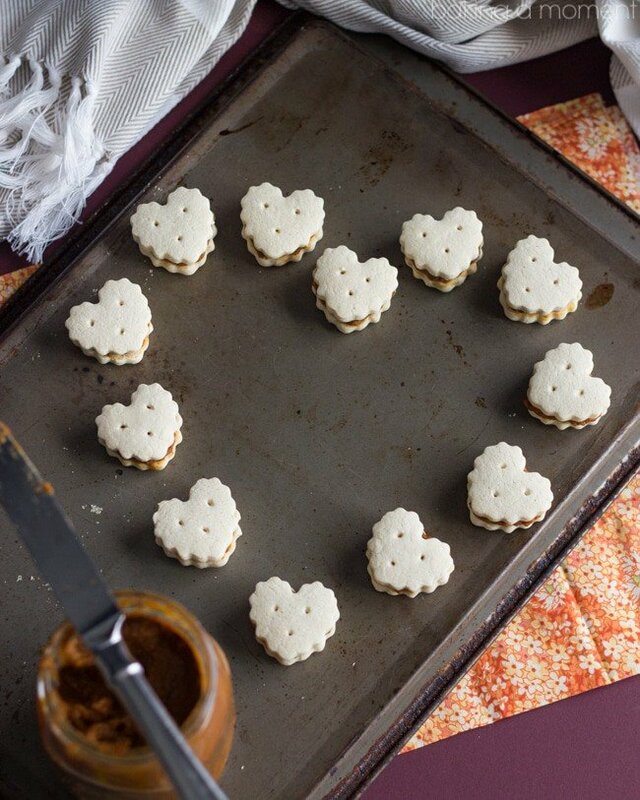 Cut shapes with a cookie cutter, and place on parchment-lined baking sheets. Prick with a fork or toothpick to prevent them from puffing up in the middle. Cool completely and sandwich with pumpkin butter. (1) You will have pumpkin butter left over. It will keep, refrigerated, for a few weeks, or frozen, for several months. 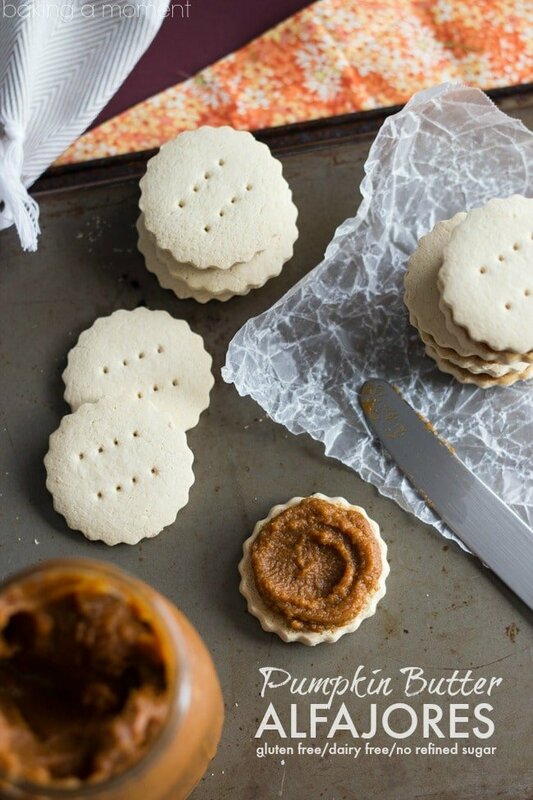 (2) Both the pumpkin butter and the cookies can be made ahead, but I would advise you to wait ’til the last minute to assemble the sandwiches. 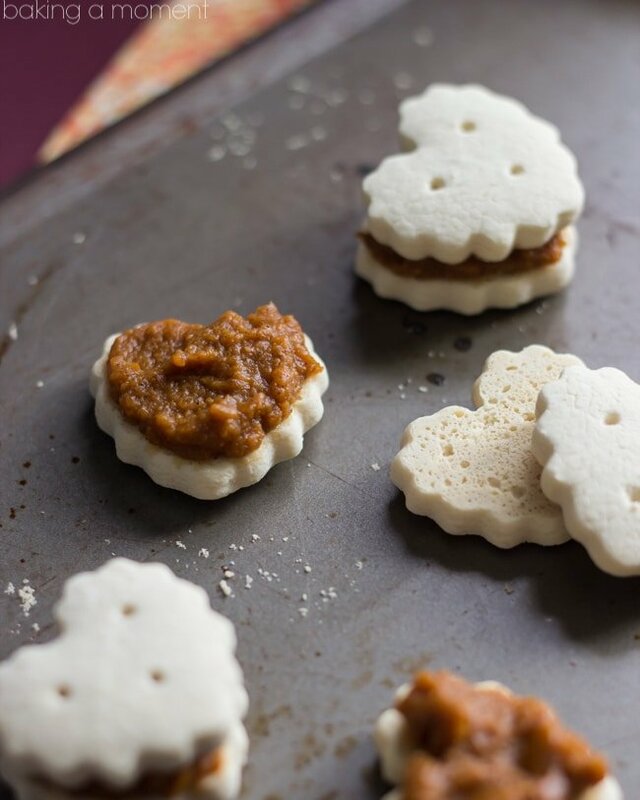 Since the pumpkin butter has a high moisture content, and the cookies have such a meltaway texture, they will get soggy if you leave them sit for too long. That said, Mr. Allie still enjoyed the heck outta these for breakfast the next morning! Recipe courtesy of Allie (www.bakingamoment.com), who adapted the filling from Tidy Mom and the cookies from Chow. Nora, I hope you enjoy every minute of your special day! I can’t wait to see the pictures! I’m so happy for you, and grateful for the opportunity to post here today. I hope you and your readers enjoyed!